3 bedrooms, 2 bathrooms, living room and kitchen, 1 terrace. It has been renovated using ecological materials and runs on solar power. Water is from a spring in the mountains. There is a big lake to swimm in. Built in a 100 year old walnut-tree overlooking a clear mountain stream, this is an experience hard to forget. kitchenette, living space, 1 bathroom (shower), sleeping space (1 double bed), 1 terrace. Tucked away in its own valley the yurt and sky-deck is a great place to get away for a relaxing break. The yurt is very comfortable and comes with kitchen, BBQ, solar-shower and compost-toilet. There is solar-power for music, lights and laptops ect.. A little stream is running by and you will find plenty of sunshine and incredible stars at night. 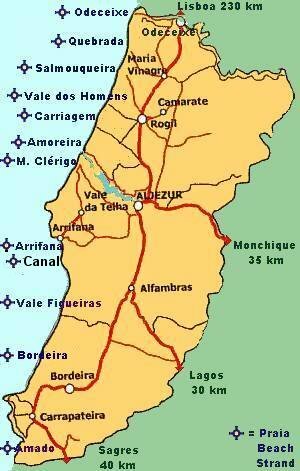 The Quinta is located in a beautiful valley ten minutes from Aljezur and fifteen minutes from the West coast beaches. Its a great place to combine a holiday in the country and at the beach. Bookings per Week (Saturday to Saturday).